Scott Bishop is a Partner and is Exec. 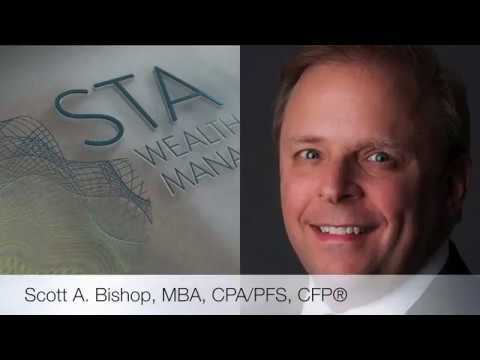 Vice President of Financial Planning at STA Wealth, a Houston based RIA Firm. In this role, Scott guides clients through the process of identifying and realizing their personal financial planning goals while working with them to help develop, implement and monitor strategies to help assure the long-term coordination of their overall financial, retirement, business planning. Scott is also the host of STA's radio show, "Financial Planning Fridays" on The STA Money Hour, on 950AM KPRC Radio in Houston at 12pm Central where he frequently discusses tax and financial planning topics and hosts interviews of industry experts. Scott graduated from the University of Texas at Austin with a Bachelor of Business Administration in Accounting and received his Master of Business Administration from the University of St. Thomas. Currently, Scott is a CFP® and a CPA and also holds a PFS® designation. Scott has been active as a member of the American Institute of Certified Public Accountants (AICPA), the Texas Society of Certified Public Accountants (TSCPA) and its Houston CPA Society as a member of its Board of Directors. He has also been recognized for excellence by being named the Young CPA of the Year for 2002-2003 by the Houston CPA Society, one of the largest and most prominent CPA chapters in the United States. In addition, Scott has both authored and has been interviewed for numerous articles in financial related publications and websites such as the Wall Street Journal, MarketWatch, CNBC, USA Today, Washington Post, The New York Times, Investopedia, Houston Chronicle, Investment News, Kiplinger, The AICPA Tax Section, BankRate.com, the Houston Business Journal and the CPA Forum. Scott is also a member of the Houston Business and Estate Planning Council. AUM information provide is for the firm STA Wealth Management, LLC of which Scott Bishop is a partner/shareholder. Please remember that past performance may not be indicative of future results. Different types of investments involve varying degrees of risk, and there can be no assurance that the future performance of any specific investment, investment strategy, or product (including the investments and/or investment strategies recommended or undertaken by STA Wealth Management, LLC (“STA”), or any non-investment related content, made reference to directly or indirectly in this newsletter will be profitable, equal any corresponding indicated historical performance level(s), be suitable for your portfolio or individual situation, or prove successful. Due to various factors, including changing market conditions and/or applicable laws, the content may no longer be reflective of current opinions or positions. Moreover, you should not assume that any discussion or information contained in this newsletter serves as the receipt of, or as a substitute for, personalized investment advice from STA. To the extent that a reader has any questions regarding the applicability of any specific issue discussed above to his/her individual situation, he/she is encouraged to consult with the professional advisor of his/her choosing. STA is neither a law firm nor a certified public accounting firm and no portion of the newsletter content should be construed as legal or accounting advice. A copy of the STA’s current written disclosure Brochure discussing our advisory services and fees is available upon request. Most Baby Boomer business owners lack a formal succession plan or exit strategy. What are the three things most financial planners do wrong and how does it affect their clients? In honor of the 20th anniversary of the Roth IRA, use these 20 facts to maximize the value in your retirement plan. Retirement Planning: What’s Your Hurdle Rate? Avoid the biggest retirement mistakes by paying attention to your hurdle rate. Use these steps to get your financial house in order, reduce stress and achieve financial goals. The Dow Jones Industrial Average (DJIA) is the oldest and most widely followed U.S. stock market index. Unlike the S&P 500 that follows the “top” 500 stocks as chosen by the Standard & Pools Compnay (a broader index), the DJIA tacks 30 stocks as chosen by the Dow Jones Company. A stock index tracks the price changes of a selected group of stock, and, although you cannot buy directly into the index, there are investment products available that closely match the performance of the DJIA. Here are factors to consider and ways to invest that will track the progress DJIA. How are the Dow 30 Stocks Chosen? The DJIA tracks the share price values and change of 30 companies selected to represent the major companies and sectors of the U.S. economy. You will recognize most, if not all, of the 30 Dow Jones Industrial companies. The index components include IBM, McDonald's, The Walt Disney Company, Exxon-Mobil, Coca Cola, Walmart, Bank of America and American Express. The stocks in the index are changed to best match the fortunes of the U.S. economy and overall stock market. For example, in 2009, General Motors was replaced by Cisco Systems after the auto manufacturer declared bankruptcy. One way to invest in the DJIA is to buy shares of each of the 30 stocks in the index. The index is share price weighted, so buying an equal number of shares of each stock would produce investment results similar to the DJIA index. At the time of publication, buying one share each of the 30 Dow Jones stocks would cost about $2,000. This might not be an efficient way to buy the index unless you could purchase a number of shares of each stock, since your stockbroker would charge a separate commission for each purchase. An exchange-traded fund is designed to track the results of a specific index. One ETF, the SPDR Dow Jones Industrial Average ETF (stock symbol DIA), directly tracks the DJIA. This ETF hold shares of the DJIA stocks in the same proportion as tracked by the Industrials stock index. Shares of DIA can be bought through any stock brokerage account and would be the most efficient way to invest in the DJIA. The SPDR DJIA ETF was formerly called the DIAMONDS Trust, Series 1. There are also index mutual funds that can be purchased to track the DJIA. It is an insurance policy that can contractually be converted into another type of insurance policy at the same insurance company. The conversion privileges are stated in the policy and the exact policies that it can be converted into will be stated by the contract and insurance company. Typically, convertible insurance deals with a level term insurance policy that can be converted into a permanent/cash value policy that may be some form of whole life or universal life. The contract will state how long that convertible options can be done (as example a 10 year level term policy may be convertible for all 10 years, but not after age 70, as example). One of the benefits of the convertibility is that although it gets converted at the age you convert it, you convert it at the same health rating as to when you applied for the policy. That is especially important if you are approaching the end of a conversion privilidage and you are not health. That is one of the reasons that Term insurance is not just a commodity that you choose to lowest cost premium. If there is any possiblity that you could convert the policy, you want to know the conversion options before you choose the term insarunce policy/carrier. Roth IRAs are a GREAT "tax bucket" to help you save for retirement. They will grow both with additional annual deposits, Roth Converstion (from traditional IRAs) or by growth of your underlying Investments (these can be stocks, bonds, mutual funds, ETFs, real estate and sometimes even private deals). I reserve my Roth IRA personally for some of my higher growth investment ideas. One of the things that I like about the growth of a Roth IRA is that all the growth will be tax-free when you take it out in retirement. If you compare that to other TAXABLE sources like pensions, Traditional IRA/401k withdrawals, Social Security and other investment income, it may be the only tax free source of income that you will have in retirement. This is very important especially if you believe that taxes will be higher when you retire and you would like a "bucket" of funds available tax free. It is also not subject to the ACA/Obamacare 3.8% Net Investment Income Tax. One of the biggest issues with Roth IRAs is that not everyone is eligible as their income is above the annual income limits (approx $133k if single and $194k if married). To "get around" that, you may want to look into doing Roth Coversions - or even a "Back Door Roth Contribution". If you have a cash value policy (whole life, universal life, etc.) that has cash value accumulated, you most likely can take a loan from the insurance policy. This can not be done with term insurance. 3) How it will effect the death benefit (or will you be putting your death benefit at risk. I life insurance loan is typically tax free (unless it was set up as a Modified Endowment Contract - this is a tax term, but important to know if it is a MEC), but if there is a gain in the policy and if the loan causes the policy to lapse in the future, the gain may be realized on your tax return as ordinary income. Some policies were designed to be very flexible for loans and some were not - be careful when taking loans from policies especially when the death benefit is important to your family or business. There are actually three different five-year rules for Roth IRAs. You need to understand each of them to maximize the benefits of your Roth IRA. If you convert your traditional IRA to a Roth IRA, any pre-tax funds in the traditional IRA that you convert are taxable to you in the year of the conversion. No matter what age you are when you convert, the 10% early distribution penalty does not apply. If you then take a distribution of the converted funds from your Roth IRA, that distribution will always be tax-free. This makes sense because you already paid taxes when you converted your Traditional IRA. However, if you are under age 59 ½ and take a distribution within five years of your conversion, your distribution will be subject to the 10% early distribution penalty, unless an exception such as disability applies. This rule was put in place to close a loophole in the rules, where traditional IRA owners, under age 59 ½, would have been able to convert to Roth IRA and then take a Roth IRA distribution to evade the early distribution penalty that would have applied if they took the distribution directly from their traditional IRA. The five-year period starts January 1 of the year you convert, regardless of the date of the actual conversion. It applies separately to each conversion you do, if you do more than one. After-tax dollars converted from a traditional IRA are never subject to the penalty. If you are over age 59 ½, no worries, you can access converted funds in your Roth IRA whenever you want without penalty. The third five-year rule that applies to Roth IRAs will affect you if you are a beneficiary. Under the rules, named beneficiaries, not those who inherit through the estate of the deceased Roth owner, have the options of stretching RMDs (required minimum distributions) from inherited Roth IRAs over their life expectancy or using the five-year rule. The five-year rule for beneficiaries is often misunderstood. Under the law, all named Roth IRA beneficiaries have the choice to use the five-year rule, but are never mandated to do so. Some Roth IRA documents may require the five-year rule, but that is relatively rare. What must you do if you elect the five-year rule? The Roth IRA you inherited must be distributed by December 31 of the fifth year following the year of the IRA owner’s death. Within the five-year period there is complete flexibility. You can take a lump sum or take a distribution each year. You just need to be sure the Roth IRA is emptied by the end of the five-year period or you will face a 50% penalty on the amount not taken in that year. That is a hefty penalty for a Roth IRA distribution, which most likely would not be taxable.